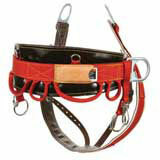 Weaver Model 1035 4-Dee Wide Back Climbing Saddle. 4-dee saddle with an extra wide back provides extra comfort and support where it's needed most. 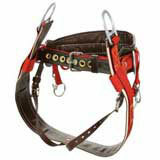 Excellent cushioning and back support are provided by the 6" wide waist back of this saddle. Foam saddle seating (1/4" thick) is sandwiched between layers of reinforced rubberized belting material and a soft brown oil tanned top grain steer hide leather lining, giving support and comfort to the back.